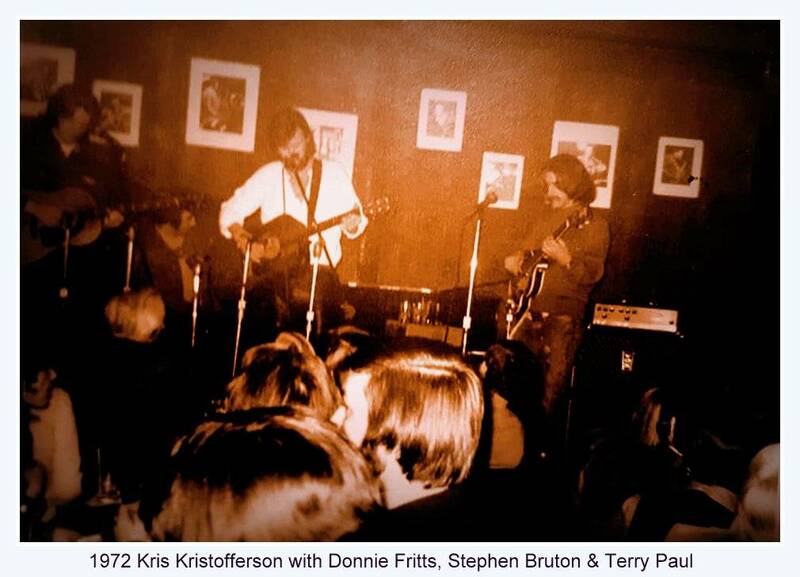 Kris Kristofferson 1972 has much in common with Kris Kristofferson from any era. A line of one of his songs is playing in my head as I write this, Time changes everything, but it won’t change me. I love you. Part of the Kris’ magic is the way his songs and sound are familiar yet unique – He somehow remains relevant within the music industry, and in the world itself. Lorrie Seng Kelley was introduced to music at a young age. She was only 12 when her Dad took her to Lennie Full name Lennie’s on the Turnpike. She watched and listened to Kris Kristofferson play with & Donnie Fritz, Stephen Bruton & Terry Paul. Many years later, she is still an avid Kris Kristofferson fan. She has tickets to Kris’ gig next year. 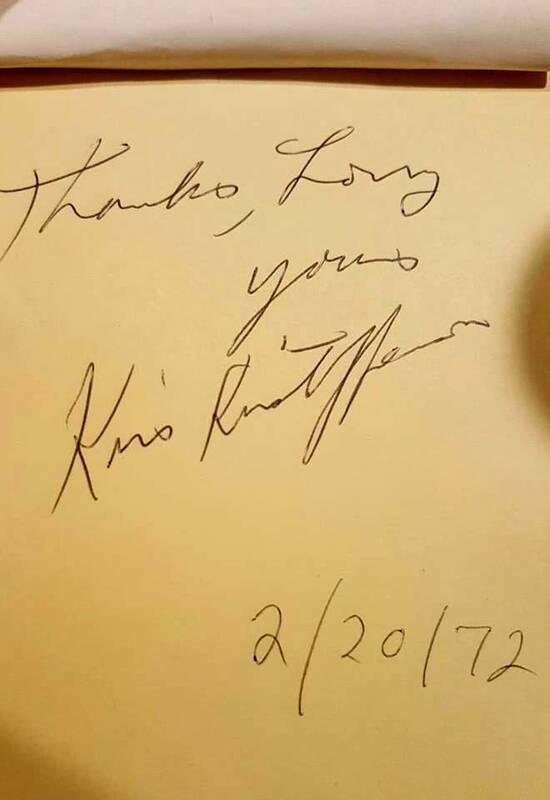 Kris Kristofferson has certainly met many of his fans, and signed countless autographs over the years. It is true that he is harder to reach these days. He often tells us that the end of his gig takes him past his bedtime. 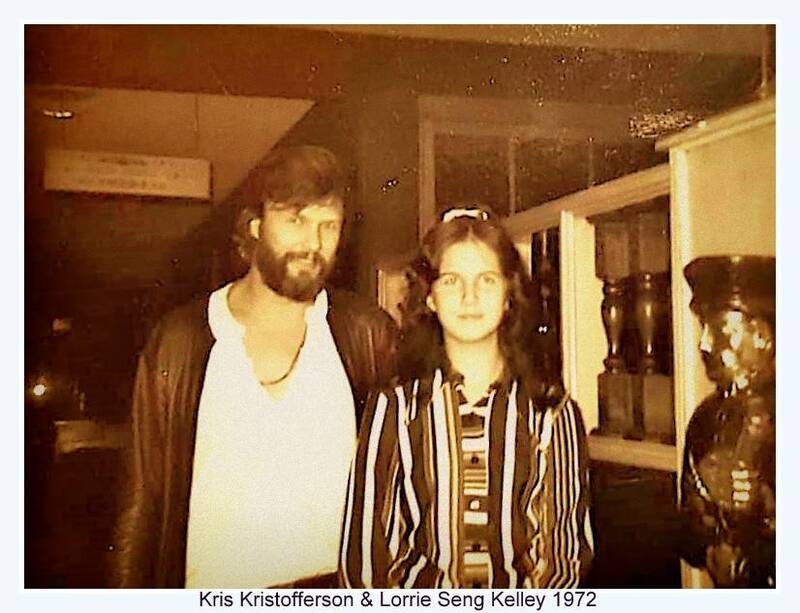 We hope that Lorrie has the opportunity to get an updated picture, and if so, that this older one makes Kris smile, and remember his earlier days. We wish Lorrie the best of luck at the upcoming gig, and hope that her kids grow up to become Kris Kristofferson fans in their own right. A lot of younger people have discovered the artist their own way – Either through their own parents, Kris’ causes and the charities he works hard to support or discovering a song they enjoy was written by the master himself. 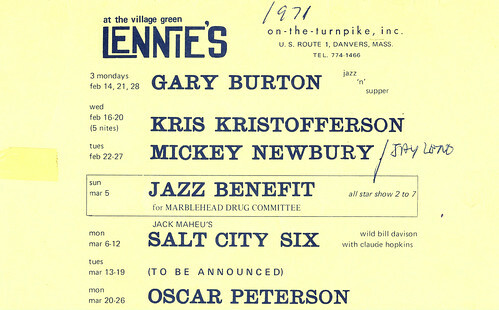 Kris performed at Lennies-on-the-Turnpike back in time when we spoke more, & wrote less. I don’t know how many times Kris played here, but we know he did some sessions in 1971. Kris was just starting out. He would become a legend in his lifetime. Lennie’s would be recognised as an iconic jazz mecca. I have asked Lennie’s relatives if they has any more information. We’ve included a link to the copyrighted pic of a flyer from 1971 in the meantime. (Links back to where the owner posted it to comply with copyright laws) If anyone comes back to us, we’ll let you know. The image for Lennies is linked only, & copyright is detailed via the link.